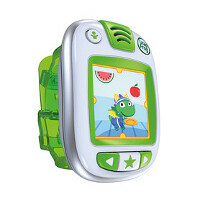 LeapFrog has introduced a wearable for kids, called LeapBand. The wristband offers a number of exercise-related features, keeping the young ones in shape. The device tells kid to 'pop like popcorn' or 'wiggle like a worm.' Children are also awarded points for completing various tasks. Earn enough points, and junior will be able to unlock virtual pets that they can play with. LeapBand is going to cost $40 when it becomes available in August. The wristband connects to a website or an app from where parents can monitor usage. And because many of the kids using LeapBand will be younger than 13, LeapFrog must follow certain regulations when it comes to obtaining data from LeapBand users. That means that your kids won't have to reveal vital information to use the device. LeapBand is the first wearable for children with an exercise-centric UI. A product called Flip is available from AT&T that can track a child's location, but doesn't offer them all of the exercises and games that LeapBand does. Made for those 4 to 7, LeapBand is durable enough to deal with the day-to-day grind of childhood. Tech needs to be earned with good behavior. I have three daughters one 5.5, one 4, and one 2.5. The oldest had an old beat up hand me down myTouch 3G I had laying around when she was 2 years old. She's a very gentle and mindful girl; she treated that old phone well so when she turned 3 we bought her a Kindle Fire for her birthday, loaded it up with kids books and kids educational games. Now she's a natural with learning UIs. She picked up using Netflix with a Chromecast without being taught how to use it, grabbed Windows Phone and started using it even though she doesn't read much, started using iOS instantly even through we don't buy Apple. My middle daughter was so rough with her sisters tablet that when she turned 3 I bought myself a Kindle Fire HD and bought a giant foam case for it and will still only give it to her when supervised, she would get caught every once in a while just standing on her sisters Kindle Fire for no freaking reason, just standing..... Reminded me of Rick James from the Chappel Show, "Like I just grind my boots info someone's couch like it's something to do....yeah I remember grinding my boots into Eddies couch." It made about that much sense. Our youngest one has no concept of being careful so she isn't getting a tablet ever. This last Christmas there was a refurbished Optimus Net for Tracfone for sale on eBay for $10. So I bought one of them for my oldest. Then once the Boost Mobile Kyocera Hydro deal at Target came up for $10 I picked up two of those. Each of my older daughters got a Hydro. The Net got passed down to the youngest one. They've proved a great cheap test. My oldest is great with hers, my middle one has taken hers and rubbed the back all over the sandpaper on the bunk bed steps.....she ain't getting anything expensive ANYTIME soon. The youngest one gets mad and throws her phone. She's not getting anything but $10 deals till she straightens up. Maybe never. Long story short, my oldest could have one of these fitness trackers but the other two are too rough. Your toddlers have their own devices?! or a stick you can pretend is a sword. Well I'm a bad father then..... Schools are going to be using technology to teach kids very soon. Just like reading, vocabulary and math, I think learning software UI's needs to be started before kindergarten. Kids these days don't know how to use their imagination like we used during the early 90s-80s. All they do is FB/TABLETS/TWITTER these days.